The Ayyubid or Ayyoubid Dynasty was a Muslim dynasty of Kurdish origins which ruled Egypt, Syria, Yemen (except for the Northern Mountains), Diyar Bakr, Mecca, Hejaz and northern Iraq in the twelfth and thirteenth centuries. The Ayyubids are also known as Ayoubites, Ayyoubites, Ayoubides, or Ayyoubides. Under Saladin, founder of the dynasty, Egypt became the leading Muslim state in the region. Saladin and his successors were also patrons of the arts and sciences, establishing religious schools, hospitals and introducing public education. They also built defensive fortifications, including the Cairo citadel. The Ayyubids are remembered for both fighting and negotiating with the Christian Crusaders. Saladin and al-Kamil signed treaties with the Crusaders, the latter returning Jerusalem to Christian rule for ten years. It was to the court of al-Kamil that Francis of Assisi traveled. The last Ayyubid ruler in Egypt was a woman, Shagarat Ad-Durr (Tree of Pearls), the first female to rule there since Cleopatra. What began with one of the most famous men in the world ended with one of the most famous women in Islamic history, although she is less well known outside the Muslim world. The Sultanate decentralized after Saladin’s death, which ultimately proved to be a fundamental weakness. It actually fell to descendants of slaves to whom Saladin had allowed a greater measure of freedom, the Mamluks. Although Cairo’s famous al-Azhar University had been founded by the Shi’a Fatimid Dynasty, it was under the Ayyubids that it became a leading center for Sunni scholarship, eventually gaining the reputation as the premier institute of learning in the Muslim world. On the one hand, the Ayyubids fought the Crusaders and aggressively evangelized among Shi’a and Christians. On the other, they gave refuge to Jews fleeing persecution elsewhere. Maimonides was Saladin’s physician. 2.2 A Queen of Egypt: last Ayyubid or First Mamluk? The Ayyubid Dynasty was founded by Saladin (Salah al-Din), who, with his uncle Shirkuh, conquered Egypt for the Zengid King Nur ad-Din of Damascus in 1169. The name Ayyub comes from Saladin's father and Shirkuh's brother, Najm ad-Din Ayyub. When Shirkuh died, Saladin quickly consolidated power, repelling a Crusader attack on Damietta in 1169 and putting down a revolt of black African soldiers. In 1171, Saladin deposed the last Fatimid Caliph, but he gradually became estranged from his former master, Nur ad-Din. "Once more Egypt knew an unchallenged master able to organize her resources in men and wealth to make war on the Franks" (Smail 1995, 34). Already, in 1170, Saladin raided the Crusader districts of Gaza and Darum. The next year he took back Aila on the Gulf of Aqaba from the Kingdom of Jerusalem. In 1171 and 1173, he raided the Transjordan fiefs of Montreal (Shobak) and Kerak. When Nur ed-Din died in 1174, Saladin declared war against Nur ed-Din's young son, As-Salih Ismail, and seized Damascus. Ismail fled to Aleppo, where he continued to resist Saladin until his murder in 1181. In 1175 and 1176, Saladin seized control of the interior of Syria, except for Aleppo. He even conquered the Jezireh in Northern Iraq, making the Zengids of Mosul and Sinjar and the Artuqids of Mardin and Diyarbakr his vassals. He also achieved control of the Hejaz and Yemen. In 1177, Saladin turned his energies against the Crusader states again, invading the Kingdom of Jerusalem from the south. Initially unopposed, he carelessly allowed his forces to scatter in search of plunder. Suddenly attacked by King Baldwin IV of Jerusalem, he was badly defeated at the Battle of Montgisard. Undeterred, Saladin invaded the Frankish states from the west and won a victory over Baldwin at the Battle of Marj Ayyun in 1179. The following year, he destroyed the newly-built Crusader castle of Chastellet at the Battle of Jacob's Ford. In the campaign of 1182, he sparred with Baldwin again in the inconclusive Battle of Belvoir Castle. Leaving the Crusaders alone for a year after September 1182, Saladin added Aleppo and some cities in Mesopotamia to his dominions. In the fall of 1183 he attacked the Latin kingdom again in the campaign and Battle of Ain Tuba'un (Smail 1995, 35-36). Saladin was also happy at time to leave the Crusaders alone as a buffer between Egypt and his enemies to the North. Over time, he entered three peace treaties, two with King Baldwin (1175 and 1180) and one with Richard (1192). The Middle East, c. 1190. 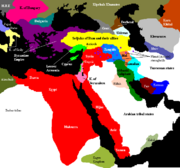 Saladin's empire and its vassals shown in red; territory recovered from the Crusader states 1187-1189 shown in pink. Light green indicates Crusader territories surviving at Saladin's death. 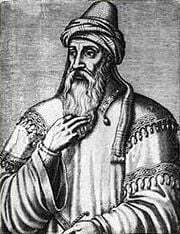 Saladin's greatest accomplishment, though, was his decisive defeat of the Crusader states at the Battle of Hattin and conquest of Jerusalem in 1187. By the end of that year he had conquered virtually all of the Kingdom of Jerusalem with the exception of Tyre, which held out under Conrad of Montferrat. Soon, however, Saladin was faced with the arrival of a major crusading effort from western Europe—the Third Crusade—led by the three greatest European rulers of the time, Frederick Barbarossa of Germany, Philip Augustus of France, and Richard the Lionhearted of England. Frederick died en route, but the remainder of the crusading armies besieged Acre, which they recaptured in 1191. The Crusaders, now under the unified command of Richard, defeated Saladin at the Battle of Arsuf, but were unable to recover the interior. Instead, Richard signed a treaty with Saladin in 1192, restoring the Kingdom of Jerusalem to a coastal strip between Jaffa and Beirut. It was the last major effort of Saladin's career, as he died the next year, in 1193. Rather than establishing a centralized empire, Saladin appointed his relations in hereditary principalities throughout his lands. His brother al-Adil ruled in the Jezireh and Transjordan; his brother Toghtekin ruled in Yemen; his nephews ruled in Baalbek and Hamah; and the descendants of Shirkuh ruled in Homs. The rest of the Empire was divided up on Saladin's death among his three sons: al-Afdal, the eldest, held Damascus and was intended to be overlord of the whole; the second, al-Aziz, took Egypt; and a third, az-Zahir, ruled Aleppo. Soon, however, Saladin's sons fell to squabbling over the division of the Empire. Al-Aziz and az-Zahir refused to recognize their brother's suzerainty. At the same time, the northern vassals of the Ayyubids, the Zengids and Artuqids, attempted to assert their independence and restore Zengid rule in the region. Saladin's wily brother Al-Adil defused these efforts, but the situation remained unstable. In the meanwhile, relations between al-Aziz and al-Afdal had reached a breaking point. In 1194, al-Aziz invaded Syria and reached Damascus. Al-Afdal called in the aid of his uncle al-Adil, who mediated between the brothers. A settlement was arranged in which Judea would be ceded to al-Aziz and Latakia to az-Zahir, but both would recognize their older brother's suzerainty. This settlement, however, did not last long. In 1195, al-Aziz once again invaded Syria. Al-Adil once again came to al-Afdal's rescue, and al-Aziz was forced to retire to Egypt, but al-Adil prevented his nephew from taking Egypt itself away from al-Aziz. Soon, however, al-Adil abandoned his support for al-Afdal, whose incompetent rule was provoking discontent throughout his lands. He allied with al-Aziz instead, and the two in 1196 captured Damascus and exiled al-Afdal to Salkhad in the Hauran. Al-Aziz was recognized as head of the dynasty, and al-Adil ruled in Damascus. Francis of Assisi before Sultan al-Kamil. In November 1198, al-Aziz died in a hunting accident. He was succeeded by his eldest son, al-Mansur, a boy of twelve. Al-Aziz's ministers, worried about the ambitions of al-Adil, summoned al-Afdal to act as Regent of Egypt in the name of his young nephew. Early in the next year, while al-Adil was in the north suppressing an Artuqid rebellion, al-Afdal and az-Zahir came together in alliance against him, and were joined by most of the other Ayyubid princes. Al-Adil quickly returned to Damascus on the approach of his nephews' armies, leaving his eldest son al-Kamil to conduct operations against the Artuqids, but the armies of his enemies were strong enough to besiege their uncle in Damascus for six months. Al-Adil used the time to win over many of the supporters of his nephews, and when al-Kamil finally arrived with a relief army in January 1200, the brothers withdrew. Al-Adil followed up on his victory by invading Egypt, where he persuaded al-Afdal to once again retire to Salkhad. Al-Adil took over the rule of Egypt, but was soon threatened again in the north by az-Zahir, who was once again joined by al-Afdal. Al-Adil was once again able to divide his enemies and eventually secured the submission of all his relations. In the settlement that emerged, by the end of 1201, az-Zahir retained Aleppo, and al-Afdal was given Mayyafaraqin in the north, while the young al-Mansur had to content himself with Edessa. Egypt, Damascus, and most of the Jezireh were under al-Adil's direct control, with three of his sons—al-Kamil, al-Mu'azzam, and al-Ashraf, acting as governor of each, respectively. Al-Adil had thus restored the unity of the Ayyubid Empire. A similar process repeated at Al-Adil's death in 1218, and at his son Al-Kamil's death in 1238, but the Ayyubid state as a whole remained fairly strong. AL-Kamil, like his uncle, Saladin, fought the Crusades but also used diplomacy. He signed a treaty in 1229 he returned Jerusalem to the Crusaders for ten years. Exactly ten years earlier, he had negotiated a similar treaty with Francis of Assisi but on that occasion the Papal Legate to the Fourth Crusade had vetoed it, arguing that Christians could not treaty with infidels. For his part, al-Kamil is said to have given Francis the key to his own mosque so that the saint could pray there. St. Francis is reported to have regards the Sultan as more a man of peace than the Cardinal was. In 1250 Turanshah, the last Ayyubid Sultan of Egypt, was murdered and replaced by his Mamluk slave-general Aibek, who founded the Bahri dynasty. Saladin had himself given greater freedom to the slave-mercenaries, or Mamlukes, who served in his army. A Queen of Egypt: last Ayyubid or First Mamluk? The Ayyubids continued to rule Damascus and Aleppo until 1260, when they were driven out by the Mongols, and following the Mongol defeat at Ain Jalut later that year, most of Syria fell to the Mamluks. Local Ayyubid dynasties continued to rule in parts of Syria (most notably Hamah) for another 70 years, until the latter finally absorbed them in 1334. As patrons of learning, the Ayyubids strengthened Al-Azhar and transformed what had been a Shi'a school into the premier institution of the Islamic world. As other great academies were destroyed following the fall of Cordoba and of Baghdad, Cairo became the leading center of learning for Muslims. Such fortifications as the citadel of Cairo Citadel remains (although it has been rebuilt over the years) an important construct, currently housing several museums. Saladin also built city walls in Cairo but these have not survived. For many years it was the main seat of government. Cairo became a place of refuge for many, including Jews fleeing persecution from elsewhere including from less tolerant Muslims, such as the Almohad's in Andalusia. Saladin is renowned for his clemency on retaking Jerusalem which only enhanced his reputation even among his foes as a chivalrous knight of honor. Hospitals built by Saladin included one for the mentally ill, which may well have pioneered their human treatment. ↑ Saladin. The Columbia Encyclopedia, Sixth Edition. Retrieved May 17, 2008. ↑ Shagrat al-Durr. WomenInWorldHistory.com. Retrieved May 17, 2008. Smail, R. C. (1956) 1995. Crusading Warfare 1097-1193. New York, NY: Barnes & Noble Books. ISBN 1566197694. Hawari, Mahmoud. 2007. Ayyubid Jerusalem (1187-1250): an architectural and archaeological study. BAR international series, 1628. Oxford, UK: Archaeopress. ISBN 9781407300429. Hindley, Geoffrey. 1976. Saladin. New York, NY: Barnes & Noble Books. ISBN 9780064928779. Humphreys, R. Stephen. 1977. From Saladin to the Mongols: the Ayyubids of Damascus, 1193-1260. Albany, NY: State University of New York Press. ISBN 9780873952637. Ibn al-Furāt, Muḥammad ibn ʻAbd al-Raḥim, Ursula Lyons, M. C. Lyons, and Jonathan Simon Christopher Riley-Smith. 1971. Ayyubids, Mamlukes and Crusaders. Cambridge, UK: Heffer. ISBN 9780852700587. Maqrīzī, Aḥmad ibn ʻAlī, and Ronald J. C. Broadhurst. 1980. A history of the Ayyūbid Sultans of Egypt. Boston, MA: Twayne Publishers. ISBN 9780805781687. Reston, James. 2001. Warriors of God: Richard the Lionheart and Saladin in the Third Crusade. New York, NY: Doubleday. ISBN 9780385495615. Smet, D. De, Urbain Vermeulen, and J. van Steenbergen. 1995. Egypt and Syria in the Fatimid, Ayyubid, and Mamluk eras. Orientalia Lovaniensia analecta. 73, 83, 102, 140. Leuven, BE: Uitgeverij Peeters. ISBN 9789068316834. Tolan, John Victor. 2007. Le saint chez le sultan: La rencontre de François d'Assise et de l'islam. Huit siècles d'interprétation. Paris, FR: Seuil. ISBN 9782020928151. Ayyubid Period at Tour Egypt. Shagrat al-Durr at Women in World History. This page was last modified on 4 May 2016, at 15:05.